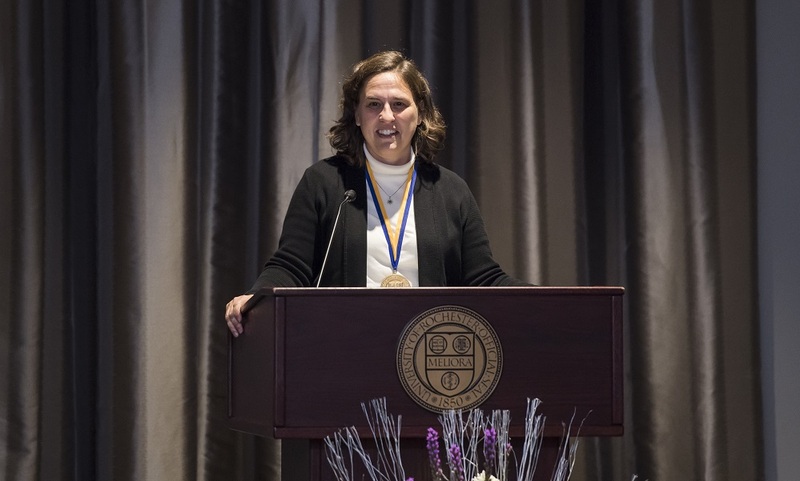 Wendi Heinzelman was formally installed as dean of the Hajim School of Engineering and Applied Sciences during an investiture ceremony December 13 in the Douglass Ballroom. Edmund A. Hajim ’58, chairman emeritus of the Board of Trustees opened the program, followed by remarks from Peter Lennie, senior vice president and the Robert L. and Mary L. Sproull Dean of the Faculty of Arts, Sciences & Engineering; from guest speakers Anantha Chandrakasan, Vannevar Bush Professor and head of electrical engineering and computer science at MIT, and Alicia Abella, assistant vice president, cloud technologies and services research at AT&T; and the investiture by Joel Seligman, University president, CEO, and G. Robert Witmer, Jr. University Professor. During the ceremony, Heinzelman talked about the importance of increasing the representation of women and under-represented minorities in engineering, and the goals of the Hajim School. A prepared version of her remarks appears below. It is an incredible honor for me to be standing here today, leading the Hajim School of Engineering and Applied Sciences as its first female dean. I am passionate about the field of engineering and the potential in educating the next generation of engineers, and in addition, I love this university, having spent my entire career here, starting as an assistant professor of electrical and computer engineering. To begin, I would like to thank University President Joel Seligman, the board of trustees, and the members of the search committee for entrusting me with this opportunity. I would like to thank the many University and Hajim School faculty members, staff, students, alumni, and friends who have expressed their support for me and, even more importantly, provided their candid input and observations. I would also like to thank Anantha and Alicia for taking time out of their very busy schedules to present to us on their vision of the future of engineering research and education. I would not be standing here today if not for the profoundly positive influences of the people who have helped guide me throughout my life. When I was growing up, engineering was not a subject that was covered in school, and had I not been born into a family where both education and engineering were highly valued, I may never have found my calling in life. My mom was a science teacher, and my dad an engineer. From my mom I learned the power of education, as she spent most of her career teaching students from an inner city with less privileged backgrounds. My dad worked at Bell Labs in its heyday, and I remember the palpable excitement just in walking into that enormous building, where great minds of the day would be discussing their latest breakthroughs. At a time well before Siri, my dad was developing technology to enable computers to understand spoken language. As a kid growing up in the 80s, this was the coolest technology I could imagine. You could actually talk to a computer and it would respond appropriately! This is what ignited my desire to learn about engineering, and in particular, electrical engineering, so that I could one day perhaps make a similar contribution to society. Everyone grows up with the impacts of engineering all around them. But many kids do not have the slightest idea about what an engineer does and could not possibly envision themselves in this profession. This leads to a big portion of our society not being adequately represented in the fields of engineering and applied sciences. Given that the best, most creative, and most efficient solutions have been shown to result from diverse groups thinking about problems, it is vital to the future of not only our School but also our profession that we increase access. To meet this goal, we as a society need to ensure that we do a better job of educating future generations about the field of engineering – the excitement of tackling difficult issues, the satisfaction of solving even a small piece of a problem, the incredible challenge that comes with being able to design the future, and the awesome responsibility to make sure that these solutions lead to positive outcomes, a healthier, happier, and more sustainable world. This is a challenge that we all are tasked with, and I know we will continue to make progress. On a day like today, it is important to think not only about our future, but also our past. Our School was established as the College of Engineering and Applied Sciences in 1958, with three departments: Mechanical Engineering, Electrical Engineering, and Chemical Engineering. In 1961, the Institute of Optics joined the college; in 2000, Biomedical Engineering was established; and in 2009 Computer Science joined the School of Engineering. A huge milestone in our history occurred in 2009 when our School was named in honor of Ed Hajim, an incredible role model for our students. A Chemical Engineer from the class of ’58, Ed was profoundly shaped as a young man by his experiences at the University of Rochester, and he has spent his subsequent years giving back and helping to shape our university and in particular our School. We are so very grateful for all Ed has done, and I personally am touched and honored that Ed has taken time out of his very busy schedule to be here today. I am taking over leadership of the Hajim School following an incredibly successful tenure by our prior dean, Rob Clark. Under Rob’s leadership, the School has more than doubled the number of undergraduate students while simultaneously increasing the quality of these amazing students; we have increased the tenure-track faculty by over 20%, attracting world leaders as well as rising stars to our departments; we have added a number of outstanding teaching faculty to our ranks; and we have attracted and retained the best staff. Exciting new programs were launched in audio and music engineering for undergraduates, and in alternative energy, biomedical device design, and technical entrepreneurship and management for master’s students, as well as interdisciplinary bachelor’s and master’s degrees in data science. A course in professional networking skills became mandatory. STEM-GEMS, a program to retain underrepresented minority and first generation freshmen, was remarkably successful, earning it a University Meliora Award. Ambitious goals were established to also increase female enrollments and to increase the number of students studying abroad. And we took major strides in building an alumni base of support. The mission of the Hajim School of Engineering and Applied Sciences is to advance the highest quality education and research in engineering and applied science through engaging experiences and environments that promote critical thinking, creativity, ethics, and leadership. So I have been focusing a lot in recent weeks on what we must do to provide an engaging and beneficial experience for our students, both in the classroom and beyond, to ensure that our students are not only educated in the fundamentals and applications of engineering, but also have gained critical skills to make them valuable citizens. In particular, it is important that our students have access to opportunities outside of the classroom in three key areas: internships, global education, and research. As engineers, it is vital that our students obtain experience in applying what they learn in the classroom into real-world situations. Internships provide such an opportunity and help students determine directions they would like to take (or not take!) in their careers. In this day and age, it is also crucial that our students understand that we operate in a global world, and engineering must be undertaken within the context of a global society. Stepping out of their comfort zones and experiencing life in a different society, a different culture, perhaps a different language, is an incredible growth opportunity that I hope many of our students can experience. From semester abroad opportunities to shorter-term faculty-led field experiences, spending time in another country can have a profound impact on the personal and professional development of our students. Finally, research is key to developing analytic and creative skills, to understanding the literature and determining how to develop new knowledge, and to fostering critical thinking that will benefit our students in whatever careers they choose. Another important goal I have is to ensure that every individual within the Hajim School is respected and valued for the contributions that he or she brings to our academic mission. Although we have made great strides to increase our enrollment of women and under-represented minority students and faculty, we need to do more to both attract and retain diverse students and faculty in our programs. At the same time, we must challenge ourselves to expand our thinking and our ideas – about the intellectual nature of our fields, the practical applications of our work, and the professional responsibilities that necessarily follow. I am also a strong believer in the benefits of cross-disciplinary thinking. The disciplines outside of engineering, in particular the humanities and social sciences, have a lot to teach us about critical discourse, and my goal is to develop opportunities for our Hajim students to engage in such discourse, to have students explore opportunities they won’t readily have once they leave the University. I believe that all educated citizens in the 21st century, regardless of major or intended career, need to have an understanding of technology, of data analysis, system design, and computer systems, and we are currently working on developing new courses and clusters that will hopefully attract non-engineers to become educated in these important skills. Research in engineering is vital to moving society forward. From improving health care and wellbeing, to creating more sustainable forms of energy, to enhancing national and international security, to developing new materials, engineering research at the University of Rochester has and will continue to propel us forward. At the Hajim School we have begun some important new research initiatives that I am excited to charge ahead with in the coming years. In particular, our Data Science Initiative has already made strides in developing novel advances in health analytics, artificial intelligence and cognition, and robotics. Building on our strong collaborations with the medical center, work being done to create a “Health Lab” promises to transform the way we monitor and develop health and healthcare solutions in the future. Rounding out our collaborative work with the medical center, new initiatives in neuroengineering promise to create new ways to enhance or replace neural systems that have been impaired. In other areas, working collaboratively with the Laser Lab for Energetics, we are developing a new initiative in high energy density physics, capitalizing on our unique ability to create and study the conditions found during planet formation and evolution. We will continue to forge novel techniques in the area of Optics and Photonics, building on our traditional strengths as well as new directions in these areas. One example is a new initiative to develop augmented and virtual reality systems that will have major impact in how we deliver information to users. And notwithstanding the human side of technology, we are continuing to develop novel media technologies, including audio, music, image and video. These initiatives are going to be key not just to the future of the Hajim School and the University of Rochester, but also to the future of society. Before I conclude, I need to thank some people who have been so important in my career and in my life. The current and former Deans in Arts, Sciences and Engineering, Peter, Gloria, Rob, David, Rich, Melissa and Joanna, have been incredible partners and mentors throughout my past 8 years in administration. I could not ask for a better group to work with day in and day out. The Hajim Senior Leadership Team and Dean’s Office staff have been instrumental in getting me up to speed in my new position. I thank my colleagues in the department of Electrical and Computer Engineering, for all of the discussions and collaborations through the years. My parents, in-laws, sisters and sister-in-law and their families, have been supportive of everything I have done and have been and continue to be a source of inspiration to me. I am so very lucky to have them all in my life and am so glad that many of them are here today. And finally, last but certainly not least, I thank my family, my husband Steve and my kids Nate and Molly. Nate and Molly have grown into incredibly kind, smart, funny and loving kids, and they have ensured that I really do find that all important work-life balance. I am so proud of them, and I am so thankful to come home to them every day. My husband Steve has been my rock since the day we first met freshman year at Cornell. Steve believes in me and he has supported me in everything I have done with my career. Most importantly, he keeps me grounded and ensures that our lives are filled with love, laughter and endless traveling and sailing adventures. To conclude, I’ve always loved our school’s motto, Meliora, which means “ever better.” To me, Meliora is about taking time to recognize, appreciate, and really celebrate how far we have come, yet always keeping an eye on where we want to go. I have no doubt that the spirit of Meliora is alive and well in the Hajim School, and I look forward to working with our students, faculty, staff, alumni and friends to achieve ever better research and educational opportunities. It is an all-important quest, the very reason for our existence, and I have no doubt we will succeed!